The Gulf of Mexico has become a repository for 4.9 million barrels of spilled oil and home to a graveyard of tarred sea life. That begs a question: Is this a good time to eat seafood? Or is it wise to avoid it? Jane Lubchenco, director of the National Oceanic and Atmospheric Administration (NOAA), says seafood is safe. Lubchenco is the latest government official (in addition to President Barack Obama) to reassure the nation that the Gulf Coast is open for business. During a live White House chat session Monday afternoon, Lubchenco fielded questions from the public about the safety of seafood from the Gulf Coast. She emphasized that the vast majority of oil that spewed from the Deepwater Horizon oil rig was concentrated within a limited area around the rig and did not contaminate the entire gulf. Consumers probed Lubchenco with a number of questions, ranging from how the seafood is tested for safety to the efficacy of testing a particular fishing ground when fish are migratory. Questioners also raised the issue of whether NOAA and the Federal Drug Administration were doing comprehensive testing that included measuring the impact of dispersants used in the water to break up escaped oil, as well as whether action would be taken to require seafood processors and restaurants to identify where seafood was harvested. Lubchenco said her agency will begin testing a closed fishing ground after the area has been free of oil for a month, thus allowing time for migrating fish to find a place in the analysis. NOAA will then conduct a two-part test, where a team of sensory experts taste and smell the seafood in question. If the seafood passes muster, it then goes to a lab where it is subjected to chemical tests that look for 12 types of hazardous compounds. At that point, the fishing area will be reopened and periodically re-tested, with limited testing conducted at the docks and in markets. Since the peak of the spill in July, when NOAA ordered 37% of all federal Gulf of Mexico fishing waters closed, the federal agency has reopened a number of areas, shrinking that figure to 22%. "There is no [oil] taint present in the waters we have re-opened," said Lubchenco, seeking to reassure a nervous public. She also noted that nature has a way of cleansing itself. For example, fish cleanse their bodies of toxins fairly quickly, while shrimp and crabs take a little longer. Oysters take the longest. Wile a quarter of the 4.9 million barrels of oil was released below the water's surface, Lubchenco said it diluted quickly and will degrade naturally due to bacteria in the water. A number of chat participants, however, queried Lubchenco on whether steps can be taken to have seafood processors label the food's point of origin. "I encourage all markets to do this," Lubchenco said. "But the best course of action is to ask." 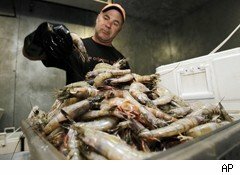 All this takes place against a backdrop in which Gulf Coast seafood and tourism industries have taken a hard hit. The backlash from the spill has prompted some restaurants and markets to do what worried consumers have requested, by providing notification about the origin of the food.